Dans cet article, nous proposons d’examiner l’anglais comme lingua franca professionnelle que nous présentons comme un champ d’études à l’intersection de l’analyse des discours professionnels et de l’anglais comme lingua franca (ELF). Notre discussion commence par un passage en revue des approches traditionnelles de l’analyse de discours professionnels où l’anglais est essentiellement conçu comme une langue d’affaires et où les aspects spécialisés sont généralement relégués au domaine des lexiques techniques. Nous poursuivons par une typologie de l’anglais comme lingua franca professionnelle à partir de la métaphore goffmanienne des discours officiels et officieux. Enfin, nous présentons quelques implications méthodologiques et pédagogiques à partir d’un corpus d’anglais comme lingua franca professionnelle conçu pour répondre aux besoins de l’analyse des discours professionnels ou spécialisés. This article examines English as a professional lingua franca, a field of study lying at the intersection of Professional Discourse Analysis (PDA) and English as a Lingua Franca (ELF). The discussion begins with an overview of the traditional approaches to professional discourse where English is mostly conceived as a business language and where the specialised aspects are generally relegated to the realms of technical lexis. It then proceeds with a short typology of English as a professional lingua franca by using the Goffmanian metaphor of frontstage and backstage discourse. Finally, it presents some methodological and pedagogical implications through the presentation of a professional ELF corpus which is tailored to the needs of professional or specialised discourse analysis. 1English is currently becoming a global lingua franca enabling millions of professionals to deal with their day-to-day activities. More particularly in France, English has become a professional skill, among many others, enabling professionals to fulfill a very wide range of purposes and handle genres from an equally wide range of domains and activity types. A problem emerges when one wonders what unifies English as a professional lingua franca, since the phenomenon emerges from extremely diverse situations, which jeopardises any attempts to conceptualise it as a specialised variety. English as a professional lingua franca may not be considered as a unified domain with clear-cut boundaries. Rather, it is a multidisciplinary field of study involving various forms of knowledge such as English as a lingua franca, business and professional discourse analysis (PDA), business and management studies, politeness theory, terminology, conversation analysis, ethnography, computer-mediated communication, and corpus analysis. The field is given coherence by a focus on the central concept of English used by professionals of other languages than English where the word “professional” refers to activities involving some form of specialised knowledge, whether this knowledge has to do with purely business or with other specialised activity fields such as engineering, medical consultations, trials, management, etc. Since English has become the world's lingua franca in many professional domains, we assume that English as a professional lingua franca is not only concerned with a common core of features which have developed outside the native circles but also with professionally-bound features which are developing within global, specialised networks of professionals who are, in many cases, interconnected by technology. In this particular regard, English as a professional lingua franca is not entirely unlike the original lingua franca, the language used by merchants across Mediterranean ports for fulfilling their specialised purposes where, for example, advances in “nautical techniques, e.g., compass, rigging and hull design” increased the “rate and pace of communication” (Wansborough 1996: 1) and led to the emergence of common, structural and linguistic elements across business documents such as letters or property conveyances (ibidem: 97) . 2The example of the Mediterranean pidgin finds many echoes in today's professional world in which technology allows direct contacts between professionals on a global scale and on a daily basis. These daily, direct contacts between professionals are, at least in our view, an essential feature of globalisation and an essential factor of the specialisation of today's lingua franca. ELF is not only used as a business language, i.e. a language for fulfilling commercial purposes (Koester 2010a), but also as a specialised language fulfilling the specialised needs of professionals whose cultures, habits and priorities tend to differ significantly from each other as we will see in the cases of engineers, project managers and human resource employees. The distinction between “business” and “professional” provides the basis for a definition of English as a professional lingua franca and then leads to some methodological and pedagogical implications. 4This example illustrates the fact that “it is not always possible to find an exact correlation between the form of linguistic resources (be they lexico-grammatical or discoursal) and the functional value they assume in discourse” (Bhatia 1993: 15). A second characteristic also emerging from the example is the existence of “frontstage” and “backstage” talk as two distinctive discursive zones in which the former is defined as the “public face of the workplace” (Sarangi & Roberts 1999: 22) as in the case of doctor-patient interactions and where the latter is defined as discourse occurring between experts away from the “drama” of frontstage work activities (ibidem: 23). A third characteristic of workplace discourse is the existence of structuring, professional activities such as problem-solving and promoting, which then develop into a continuum of genre realisations. 6However, since the late 1990s and early 2000s, some studies have led to the idea that workplace discourse in general and workplace genres in particular are far from being the clear-cut realities they were originally thought to be. First, the development of ELF and corpus-based studies led to a shift from the normative paradigm to a multi-facetted one. In the new paradigm, deviations from the norm were observed for their own sake, that is as naturally occurring phenomena arising from legitimate, workplace settings where genres “mix” with, or “colonise” other genres (Bhatia 2002: 49). Secondly, in-depth, ethnographic approaches to genres suggest that the hybridisation processes may be explained not only by the generic proximity in both space (the workplace) and time (the working hours) but, also, by the “technologization of professional discourse”, a process in which “the relationship between near and distant, now and then, is transformed” (Gunnarsson 2009: 10). For example, Louhiala-Salminen's observation of a manager (Louhiala-Salminen 2002) shows that email acts as a pivotal genre with other genres in the thirty-four discoursal episodes which emerged from a single workplace, within a single day. ELF is not a variety of English with clearly demarcated formal linguistic properties to be set against some institutionalized norm of the so-called standard language, but as the variable exploitation of linguistic resources. 8The author's viewpoint finds further illustrations in ethnographic approaches showing that BELF is a cultural reality where “interactions are inherently intercultural, and are inevitably influenced by the perception people have of themselves, the perception that one has of the interlocutors and the tendency to emphasize differences, often dictated by stereotypes” (Poppi 2012: 179). The unveiled features generally concern code switching, exogenous grammatical patterns leading to accommodation or regularisations, but also discourse-related features such as politeness strategies which are unusual in Anglo-Saxon cultures although they are frequent and considered as generally acceptable in global business communities. Examples of cultural differences in how English is used in lingua franca situations abound in the literature. For example, Louhiala-Salminen and Kankaanranta (2005) contrast the direct Finnish style with the Swedish tendency to write “wordy” messages. Similarly, in her corpus-based comparison between Chinese and Italian email writers, Poppi (2012) describes the Chinese employees' tendency to “employ a more formal tone and make use of honorifics” than their Italian counterparts (ibidem: 197). The identified contrasts confirm earlier studies of politeness strategies (Gumperz 1982; Brown & Levinson 1983) which shed light on the relativity of language norms in intercultural settings and the implication that language norms “can be interpreted and understood only in relation to the background conditions that shape each situation” (Brown & Levinson 1983: 73). However, it is also very clear that the background conditions have mostly been observed through nationally defined cultures. Very little is actually known about the specialised cultures of BELF users today. 9The specialised features of BELF have generally been analysed from a Swalesian perspective, that is through technical lexis, terminology and “community-specific abbreviations and acronyms” (Swales 1990: 26). According to Nickerson (2000), the specialised features of BELF not only include “technical lexis” which she defines as “what the company [does]” and as the “technical process involved and the goods produced”, but also organisational lexis defined as “as lexis denoting the corporate context such as “procedures”, “corporate units and positions within the corporate hierarchy” (ibidem: 159). Drawing from Bhatia (1993) and Yates and Orlikowski (1992), Kankaaranta (2005) adopts a similar approach to linguistic specialisation by considering it as corporate “jargon” (ibidem: 285). More recently, Poppi (2012) has described specialised usages as abbreviated forms of technical vocabulary (“shpt”, “vsl”, “cnee”) which occur more frequently than the full forms themselves (“shipment”, “vessel”, “consignee”) in the international trade industry in China. Lexis therefore appears as a particularly salient area to account for specialised usages in the workplace but also as a limit to the lingua franca metaphor. Contrary to the Mediterranean contact language indeed, today's lingua franca does not borrow its lexis from other languages but literally lends its corporate-bound and technical lexis to its users. The lending phenomenon emerged in our interviews with French corporate employees who, although they spoke French, would regularly use corporate-bound and technical lexis such as “business unit”, “project leader”, “strategic accounts manager”, or “community manager”. 11Since the early 1990’s and the spread of communication technologies allowing (specialised) professionals to communicate on a global level, which in turn has led to the spread of English as a lingua franca, little attention has been paid to inter-domain variations within professional discourse. The studies mentioned so far have indeed focused on discourse variation within particular genres, irrespective of the professional or specialised cultures. However, variations are particularly salient, as the data from our own corpus illustrates. 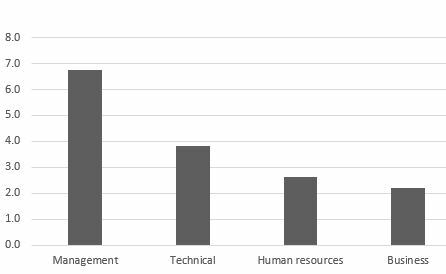 Figure 1 shows that the frequency of two basic formal features of email correspondence, namely opening and closing phrases, present significant variations according to the professional situation: business and technical situations emerge as the most formal cases as opposed to human resources and management situations. Message 1. Email sent by a French sales manager to a Japanese customer. We transmitted your claim to our quality dept. The answer from our quality dept will follow. However, could you please push your quality dept. to reply within today so that we can give your comment to [orgNameD07] today? 13These formal features not only serve the formal expectations business partners typically have in this domain but also contribute to maintaining a sense of “normality” (Firth 1990), thus compensating for linguistic problems EFL users regularly encounter in their business correspondence. Example 2. Email exchanges from the management domain. You need me for anything? 15The exchange above illustrates our ethnographic findings showing that 47% of French employees working on a global scale use English as a default language in their written communication.2 The exchange also illustrates Louhiala-Salminen's observation of “discourse sequences” (Louhiala-Salminen 2002) in which managers are involved. Due to the multi-modal nature of the manager’s job, emails tend to take on conversational features such as the direct question (“how did it go today?”), the elliptical style (“you need me for anything?”), and the cohesive marker “it” referring to the immediate context of the situation (here, a meeting). As in the previous example, discourse is structured or, rather, “conversationalised” (Fairclough 1992), by the very nature of global management involving a considerable amount of informal communication on various channels within small, specialised networks (Zarifian 1996; Mintzberg 2009) who share the same specialised context.3. What has been observed qualitatively in the literature may be evidenced quantitatively by studying the frequency of exophoric features, that is linguistic elements such as articles, pronouns, and demonstratives referring to the context of the situation. As figure 2 shows, exophoric features are more frequent in our management subcorpus than in the other professional situations. According to our HR procedure (Recruitment [ref00]) available on [ref01] all induction trainings must be done as soon as a new employee joins [orgNameA0]. HR must ensure that all mandatory trainings are scheduled and done especially for sensitive positions like Clinical Specialists. If the deadlines are not met, HR would face an internal dysfunctionment which would be not fair after the strong efforts we have made in upgrading our procedures. 17As our three examples attempt to show, the realisations of professional genres such as emails are highly dependent upon the specialised nature of the situations in which the professionals are engaged. 20Thanks to the development of computer-mediated communication and new forms of network-based management (Mintzberg 2009) leading employees to work collaboratively on a global scale, this form of talk has expanded and has become a core feature of English as a professional lingua franca. 4 Retrieved from <http://www.asd-ste100.org/> on 10 February 2015. 5 Retrieved from <http://en.pequignet.com/message-from-the-president> on 10 February 2015. 23It is also worth noticing that some forms such as “succeed to remain” or “promote French industry”, although they may be negatively appraised, seem legitimately used since most targeted readers are likely to be found in the other expanding circles of English such as Eastern Europe or Asia. 24Since professional discourse obviously covers situations ranging from the most technical or obscure to outsiders (e.g. exchanges between engineers or technicians) to the most ordinary and apparently clear situations (e.g. gossip, office talk), one may wonder what unifies professional ELF and whether it is possible to consider it as a specialised domain within the field of English studies. 25Along the cline of ordinary talk, it seems that although the forms are not specialised by nature, their meanings may be regarded as specialised in that they are given a specialised interpretation by the social actors engaged in the professional situation. The “cat” example shown earlier shows that, although the word “cat” obviously belongs to the “general domain” of ordinary talk, the main meaning should be interpreted within the framework of medical consultation in that the word establishes a professional relationship between a medical consultant and a patient. The specialised logic also applies to the “Swedish Champagne” example found in our HR corpus of professional ELF where the ordinary language is used for maintaining friendly relationships in a multicultural workplace. there is no special handling for such a bag. There will be only a warning message to the operator, but the bag will not be rerouted automatically. The operator has to investigate what the reason for the recirculation is and then take the necessary measures (for example extract the bag, change the destination in the flight table, map the destination to another destination). 27In this framework, ELF, or rather, the fact that professional discourse is produced by natives of other languages than English, may be considered a legitimate, specialised variety of English because it emerges from specialised situations where legitimate professionals carry out activities of many kinds, from the most official to the most confidential, through spoken and written channels. It is worth noting that the increased range of communicative situations, led by the development of information technologies, tends to reinforce the status of professional ELF as a variety. 28Compared with other specialised (scientific or academic) domains where the texts are widely available and therefore allow the building of large corpora (i.e. exceeding one million words), corpora of professional discourse in general and of professional ELF in particular are rather scarce and fairly small. This characteristic is particularly salient in corpora representing backstage situations. In the case of emails in professional or business ELF (Gimenez 2000; Nickerson 2000; Bondi 2005; Kankaanranta 2005; Louhiala-Salminen et al. 2005; Gimenez 2006; Jensen 2009), the corpora generally consist of a few hundred messages in spite of the fact that this type of text has become one of the most widespread genres in the workplace with millions of messages sent and received everyday. Moreover, existing corpora generally focus on purely business situations (e.g. selling and buying) to the detriment of other equally widespread, specialised activities such as technical or administrative problem-solving or team management. As we mentioned earlier, this orientation is mostly due to a traditional, business genre-based view of professional discourse. 6 Retrieved from <http://www.univie.ac.at/voice/page/corpus_information > on 10 February 2015. 29An ambitious attempt at characterising professional ELF from a specialised perspective, that is a corpus allowing for the study of inter-domain variation may actually be found in the professional part of the Vienna-Oxford Corpus of International English (VOICE 2013). The sub-corpus is divided into three sections, each section focusing on a particular area, i.e. “business” (“all social situations connected with activities of making, buying, selling or supplying goods or services for money”), “organisational” (all social situations connected with activities of international organizations or networks which are not doing research or business), and “research and science” (“all social situations connected with the careful study of a subject, especially in order to discover new facts or information about it”).6 These areas may not, however, be regarded as “specialised domains” as defined by Petit (2010) and Van der Yeught (2012), since the purposes are so broadly defined that, although they may help characterise language use in professional context in general, they can hardly allow the identification of specialised meanings which is what corpus analysis in professional contexts should also seek to achieve. 30In line with previous research into workplace discourse explored through corpus linguistics, we suggest that corpora seeking to represent English as a professional lingua franca should be based on the notion of recurrent situation, which provides “background information […] useful not only for interpreting the data”, but also for “corpus design” (Koester 2010b: 72). According to the systemic functional framework, a situation is defined by three parameters, namely field, mode, and tenor where field refers to the ongoing activity or “domain of experience” (Matthiessen et al. 2010: 95), mode refers to “the role played by language in the context” (ibid. : 144), and tenor refers to the “role relationships” (ibid. : 217). We claim that this framework is broad enough to embrace both frontstage and backstage situations, as shown in table 1. 31At least in Europe, most corpora in this field of study originate from Northern and Central European countries such as Finland, Sweden or Austria. Corpora originating from the Southern parts of Europe such as Italy, Spain, or France are extremely few, which, we assume, poses the problem of the nature of ELF both in its general and professional forms. We assume that, although ELF usages present very similar features across linguistic backgrounds, variations according to the professional background have been evidenced, thus requiring a broader approach to ELF including forms deriving from the speakers of Roman languages. 32Our corpus data consist of 400 emails (33,000 words) collected from fourteen companies based in France and using English as a lingua franca. In all cases, English is used on a day-to-day basis with partners from inside and outside the company. English is also used as a problem-solving language in the four recurrent, professional situations we have identified from the data: business, team management, technical exchanges, and company administration. Business problem-solving includes situations where participants share and discuss information about the buying and selling of goods. The team management situation includes cases where managers coordinate projects of various kinds such as implementing computer systems, or designing furniture. The technical exchanges comprise situations where technicians and engineers share and discuss information about the making of products. The administrative problem-solving situation includes information exchanges from a human resources department in a small multinational firm. In all situations, English is used as a lingua franca alongside French and, in a few cases, other languages like German, Spanish, Italian and Chinese. Our findings suggest that English emerges in emails in specialised networks spreading across professional communities (from business managers to secretaries, from engineers to administrative staff, etc.). Specialised coherence is given by the focus of each professional situation on one particular topic emanating from the network node, that is the professional starting the online discussion. As table 2 seeks to illustrate, subject lines are generally indicative of the specialised nature of the field covered by the discussion. 33The network nodes correspond to the email donors who accepted to transmit a part of their routine correspondence in English. By using the literature on social networks (Freeman 1979; Milroy 1987) and, more particularly, that on network visualisation (Freeman 2000; Degenne & Forsé 2004), we represented the socio-professional network of each donor and placed the donor in the middle of the graph. Each recipient list was then used to draw the constellation of partners. Network links were finally represented by a straight line each time a message was shared (written and/or received) by one or several participants. During the representation process, we also obtained some ethnographic information about each point of the network such as the participants’ mother tongue, their nationality or the job they occupied when the network was observed. The graphic representation of each network helped us visualise and identify clusters, that is dense parts of the network where emails were sent and received by small sets of quasi- or fully interconnected professionals. 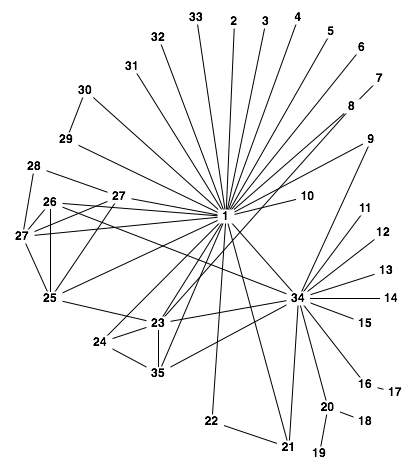 An example of a socio-professional cluster may be found on figure 3 with numbers 1, 25, 26, 27, and 28. In these parts, discourse was typical of backstage, specialised talk. Features included problematic issues, informal stretches of discourse, specialised abbreviations, and direct references to the ongoing situation. Some cases of what may be called “specialised cluster talk” may be found in examples 2, 4 and 5 quoted above. 34The corpus is organised according to the situation type which we define here as a set of systemic parameters (Halliday 2004). The “field parameter” consists of the professional activity type as defined in table 2. The “tenor parameter” includes contextual data such as the status of English among the writers (L1 or L2) and the network density (high versus low). The “mode parameter” is not taken into consideration in this corpus since all messages were produced on the same (written) channel and (electronic) medium. The corpus may therefore be considered as a typical sample of professional email exchanges where English is both an international language in that it comprises both L1 and L2 writers, and a lingua franca stricto sensu in the case of exchanges between L2 writers. Although the corpus is relatively small, it remains representative of the described situations since, as is often the case in workplace talk, discursive and linguistic features are generally repetitive. Conversely, less repetitive material may sometimes be considered as “key” features, either from a statistical or from a specialised viewpoint. Statistically, keywords are defined as words which are “significantly more frequent in a sample of text than would be expected, given their frequency in a large general reference corpus” (Stubbs 2010: 25). 35Such words may be identified by using concordance tools such as AntConc (Anthony 2006). “Fuel injection volume”, for example, may be considered as a key phrase of the technical subcorpus, since it is obviously over-represented compared with the other subcorpora and, more generally, with any corpus of general English. Specialised keywords, on the other hand, are cultural entities, which are not statistically defined and which, as Wierzbicka (1997) suggests, are “a focal point around which entire cultural domains are organised” (ibidem: 156). The word “bag” described in example 5 above is a case in point: although it may not be statistically significant, it is culturally relevant in that, at least in the technical exchanges between engineers in electronics, it is clearly a focal point around which the specialised activity is organised. 7 Retrieved from <https://fr.linkedin.com/> on 5 January 2015. 36In addition to corpus data, our study of professional ELF was complemented by some ethnographic research which allowed us to explore the functions of English in the French workplace according to the different activity types. This sort of data was obtained through interviews, field work and an online survey on the socio-professional network LinkedIn.7 As the literature on corpus-based research suggests, ethnographic data may provide insights into the corpus analysis of specialised language and discourse. In this area of knowledge, specialised meanings are regarded as a complex intertwining of language and domains including “more global, encompassing social as well as international and cognitive issues” (Schulze & Römer 2008: 266). 37The notion of lingua franca in professional situations is only one tenor-related parameter alongside others such as the institutional or the discursive roles taken by the participants. Although it may be studied for its own sake, English as a professional lingua franca should not be treated as a “special” or “separate” variety either in anglais de spécialité (ASP) or in English for specific purposes (ESP) but rather as a typical or recurrent situation within the overarching domain of PDA which comprises all the relevant parameters for studying the discourse and the language found in all kinds of professional contexts. Since professional situations may also be defined according to the parameter of activity field, and since field obviously plays a leading role in linguistic and discursive realisations, it is possible to consider PDA as an overarching domain within ASP and ESP studies comprising smaller domains which may in turn be more or less broadly defined according to the field of activities and knowledge they cover. This leads us to define professional discourse as “specialised discourse” in the French sense of the term, that is “knowledge and practice used for a similar purpose” (Van der Yeught 2012: 13).8 In this category, the purpose in question may be defined by using the notion of professional situation as defined earlier. Quite recently, this specialised approach to PDA was echoed in the Journal of Business Communication which became the Journal of Business and Professional Communication. According to the editor, adding the word “professional” refers to the consideration of both business and “other fields such as technical or scientific communication” (Dubinski 2014: 3). 39As previously shown in this article, this may be explained by the fact that professional genres tend to be taught independently from domains and by applying the teaching of “business” genres to all kinds of situations. Our study suggests, however, that situational parameters such as field (variation according to the activity type) and tenor (variation according to the status of English) should also be taken into consideration since they are constitutive of and significantly influence professional realities. Emails, for example, are clearly colonised by conversational features in the manager's situation because of the highly cooperative nature of the manager's job. Conversely, they have remained a fairly formal, epistolary genre in other situations such as business or human resources situations where the communicative expectations derive from a shared service-provider's culture. This observation calls for a multi-facetted approach to teaching professional discourse in English. In this specialised approach, linguistic features should not be studied as isolated, idealised models but, on the contrary, as inseparable from professional cultures. Anthony, Laurence. 2006. AntConc 3.4.3. Retrieved from <http://www.antlab.sci.waseda.ac.jp/antconc_index.html> on 5 January 2015. Bhatia, Vijay K. 1993. Analysing Genre: Language Use in Professional Settings. Harlow: Pearson Education Limited. Bhatia, Vijay K. 2002. “Professional discourse: Towards a multi-dimensional approach and shared practice”. In Candlin, C. N (ed. ), Research and Practice in Professional Discourse. Hong Kong: City University of Hong Kong Press, 39-60. Bhatia, Vijay K. 2008. “Genre analysis, ESP and professional practice”. English for Specific Purposes 27, 161-174. Bondi, Marina. 2005. “People in business: The representation of self and multiple identities in business emails”. In Gillaerts, P. & M. Gotti (eds. ), Genre Variation in Business Letters, Bern: Peter Lang, 303-324. Brown, Penelope & Steven C. Levinson. 1983. Politeness: Some Universals in Language Usage. Cambridge: Cambridge University Press. Degenne, Alain. & Michel Forsé. 2004. Les Réseaux sociaux (2nd ed.). Paris: Armand Colin. Dubinski, James M. 2014. “Editorial”. Business and professional communication quarterly 77, 3-4. Firth, Alan. 1990. “Lingua franca negotiations”. World Englishes 9, 263-280. Firth, Alan. 1996. “The discursive accomplishment of normality: On lingua franca English and conversation analysis”. Journal of pragmatics 26, 237-29. Freeman, Linton C. 1979. “Centrality in social networks: Conceptual clarification”. Social networks 1, 215-239. Freeman, Linton C. 2000. “Visualizing social networks”. Journal of social structure 1. Retrieved from <http://www.cmu.edu/joss/content/articles/volume1/Freeman. html> on 6 January 2015. Gimenez, Julio C. 2000. “ Business email communication: Some emerging tendencies in register”. English for Specific Purposes 19, 237-51. Gimenez, Julio C. 2006. “Embedded business emails: Meeting new demands in international business communication”. English for Specific Purposes 25, 154-172. Gumperz, John J. 1982. Discourse strategies. Cambridge: Cambridge University Press. Gunnarson, Britt-Louise. 2009. Professional Discourse. London: Continuum. Halliday, Michael A.K. 2004. An Introduction to Functional Grammar (3rd ed.). London: Hodder Education. Heritage, John. & Sue Sefi. 1992. “Dilemmas of advice”. In Drew, P. & J. Heritage (eds. ), Talk at Work: Interactions in Institutional Settings. Cambridge: Cambridge University Press, 359-418. Jenkins, Jennifer, Marko Modiano & Barbara Seidlhofer. 2001. “Euro-English”. English Today 17, 13-19. Jensen, Astrid. 2009. “Discourse strategies in professional e-mail negotiation: A case study”. English for Specific Purposes 28, 4-18. Kankaanranta, Anna. 2005. Hej Seppo, Could You Pls Comment on this! Internal Email Communication in Lingua Franca English in a Multinational Company. Jyväskylä: Jyväskylä University Press. Koester, Almut. 2006. Investigating Workplace Discourse. London: Routledge. Koester, Almut. 2010a. Workplace Discourse. London: Continuum International Publishing Group. Koester, Almut. 2010b. “Building small specialised corpora”. In O'Keeffe, A. & M. McCarthy (eds. ),The Routledge Handbook of Corpus Linguistics. London: Routledge, 66-79. Louhiala-Salminen, Leena. 2002. “The fly's perspective: Discourse in the daily routine of a business manager.” English for Specific Purposes 21, 211-231. Louhiala-Salminen, Leena & Anna Kankaanranta. 2005. “Business genres in a state of flux”. In Gillaerts, P. & M. Gotti (eds. ), Genre Variation in Business Letters. Bern: Peter Lang, 55-87. Louhiala-Salminen, Leena, Maggie Charles & Anna Kankaanranta. 2005. “English as a lingua franca in Nordic corporate mergers”. English for Specific Purposes 24, 401-421. Maier, Paula. 1992. “Politeness strategies in business letters by native and non-native English speakers”. English for Specific Purposes 11, 189-205. Matthiessen, Christian M.I.M, Kazuhiro Teruya, & Marvin Lam. 2010. Key Terms in Systemic Functional Linguistics. London: Continuum. Millot, Philippe. 2014. “Thinking outside of the box: réflexion sur l'acceptabilité en anglais lingua franca professionnelle”. ILCEA 19. Retrieved from <http://ilcea.revues.org/2499> on 5 January 2015. Milroy, Lesley. 1987. Language and Social Networks. Oxford and New York: Basil Blackwell. Mintzberg, Henry. 2009. Managing. San Francisco: Berrett-Koeler Publisher. Mourlhon-Dallies, Florence. 2008. Enseigner une langue à des fins professionnelles. Paris: Didier. Nickerson, Catherine. 2000. Playing the Corporate Language Game: An Investigation of the Genre and Discourse Strategies in English Used by Dutch Writers Working in Multinational Corporations. Amsterdam: Rodopi. Nickerson, Catherine. 2005. “English as a lingua franca in international business contexts”. English for Specific Purposes 24, 367-380. Petit, Michel. 2010. “Le discours spécialisé et le spécialisé du discours : repères pour l'analyse du discours en anglais de spécialité”. E-rea (en ligne) 8. Retrieved from <http://erea.revues.org/1400> on 6 January 2015. Poncini, Gina. 2005. “Constructing an international event in the wine industry: an investigation of emails in English and Italian”. In Gillaerts, J.C. & M. Gotti (eds. ), Genre Variation in Business Letters. Bern: Peter Lang. Poppi, Franca. 2012. Global Interactions in English as a Lingua Franca: How Written Communication is Changing Under the Influence of Electronic Media and New Contexts of Use. Bern: Peter Lang. Sarangi, Skrikant. 2002. “Discourse practitioners as a community of interprofessional practice: Some insights from health communication research”. In Candlin, C.K. (ed. ), Research and Practice in Professional Discourse. Hong Kong: City University of Hong Kong Press, 95-136. Sarangi, Srikant & Celia Roberts (eds.). 1999. Talk, Work and Institutional Order: Discourse in Medical, Mediation and Management Settings. Berlin and New York: Mouton de Gruyter. Schulze, Rainer & Ute Römer. 2008. “Introduction: Patterns, meaningful units and specialized discourses”. International Journal of Corpus Linguistics 13, 265-270. Shaw, Philip. 2011. “Conditions for success in lingua franca interaction”. ASp 60, 65-79. Stubbs, Michael. 2010. “Three concepts of keywords”. In Bondi, M. & M. Scott (eds. ), Keyness in Texts. Bern: John Benjamins Publishing Company, 21-42. Van der Yeught, Michel. 2012. L'Anglais de la bourse et de la finance : description et recherche. Paris: Ophrys. VOICE. 2013. Corpus information. Retrieved from <https://www.univie.ac.at/ voice/page/corpus_information> on 8 December 2014. Wansbrough, J. 1996. Lingua franca in the Mediterreanean. Richmond: Curzon Press. Wierzbicka, Anna. 1997. Understanding Cultures Through their Key-Words. Oxford: Oxford University Press. Yates, Joane & Wanda Orlikowski. 1992. “Genres of organizational communication: Structurational approach to studying communication and media”. Academy of management review 17, 299-326. Zarifian, Philippe. 1996. Travail et communication: Essai sociologique sur le travail dans la grande entreprise industrielle. Paris: Presses Universitaires de France. 1 En mécanique, à la différence de l'informatique, la question de l'échec, de l'imprévu, du général et du particulier, ne constitue pas un point de focalisation du discours. Les machines marchent, leur technologie est maîtrisée. L'incertain n'a pas sa place dans les documents examinés car il sera synonyme de défectuosité. 2 The figure is taken from a longitudinal study conducted on the socio-professional network LinkedIn involving 64 French participants using English as a working language. To the question “why do you use English in your email correspondence?”, 58% answered “it is the language of my business partners”, 47% answered “I use English by default in my professional emails”, and 34% answered “it is the ‘official’ language in the company”. 3 According to our study of emails exchanged by French professionals in English, almost 70% of messages are exchanged within networks of 2 to 5 participants. Philippe Millot, « Defining English as a professional lingua franca: a specialised approach », ASp, 67 | 2015, 5-26.